Death Knights will now check for Blood Presence instead of Frost Presence for tanking (the description wasn't updated, please update DISABLE_WHILE_TANKING_DESC at http://www.wowace.com/addons/omen-th.../localization/ for your language). I have always used Omen and love it. But as of late it doesnt pop up and also i get an error message in my chat window about a addon something isnt working. I havent really changed my addons too much but i have added a few but they have nothing to do with combat. Would love some insite on what i could do. Do you have a LDB Display addon? 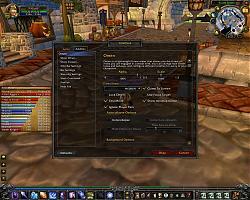 Omen provides a LDB Display plugin which other addons can detect and utilize to create a minimap button. Perhaps you can list all your addons. i had the 2nd minimap button display "problem" too this whole time since the last update, but there was a fix for it. just go into the omen settings and choose the fubar option. the box to hide the icon on minimap was already checked, but unchecking and then re-checking the box hid the icon for good. just had to do it for all my toons and it was fine. glad you made a separate fix for it though thanks. Hi there first off love omen. I may have discovered a bug with omen, its a small one. Both the version on curse and wowinterface are displaying 2 minimap buttons with the ability to only turn 1 off. I went back to my older version, the one before curse update and the second button went away. Thanks for the hard work on this addon. You have a LDB-Display addon that is adding the second minimap button because Omen also provides a LDB feed. Edit: Will look into this after I get lunch. Last edited by Xinhuan : 07-09-11 at 11:36 PM. Just to confirm, this version of omen does work with 4.2. That is, "updated for 4.2" is not misleading, because code already exists to handle 4.2 changes. Please update the toc file to reflect this assertion. Thats misleading and needs to be looked into by the admins of this site. I have noticed several so called Updated for 4.2 and it has not been. Its a lie. It has NOT been updated for 4.2. It's updated for 4.2 in the sense that code has already been added to Omen 3.1.2 two months ago to take into account the code changes in patch 4.2. See change log "Fixed potential errors caused from combat log changes introduced in patch 4.2 PTR (untested on PTR servers)." Therefore, you will probably encounter no issues using the current version of Omen as-is unless Blizzard has some last minute changes in the patch (that I am unable to actually test yet). I've yet to hear anyone with issues so far. Last edited by Siannus : 06-28-11 at 06:27 PM. There is currently a problem with Omen v3.1.2 where, while tanking a creature/boss/etc You can see the TPS but you cannot see the actual amount of threat built. At best it will show you 100%, but with no accompanying number (ie 100% 450.1k for having built 450k threat total on the boss/creature). I play a bear and I'm not sure if perhaps this is a feral related issue but if it could be looked into and somehow remedied, it would be a big help. The only way to currently fix the problem is to toggle the Profile settings away from your current profile and then back to it. This seems to fix the problem for a while at least. This problem exists in the newest version of omen. We set up the default behavior for profiles to be character specific (as do many other addons like Recount, etc) because we expect users to want them to be character specific. A healer would not need much of a threat display, a DPS and a tank character will want different settings and warnings, etc. For players who customize their UIs a lot, they tend to become "role specific". Just make all characters load the same profile, so when you change one, you change for all characters. Note that the profile named "Xinhuan - Barthilas" as an example, is simply just a name for a profile, it is not character specific. It could have been named "Look Ma! No Hands!" or "This is the default" or anything you want. Thus, you can have all of your characters use the same shared "Look Ma! No Hands" profile. Or the "Xinhuan - Barthilas" profile. the only time this ever really matters is when i scrap my entire UI, set up everything differently, then those particular addons all need to be individually set to default on every toon, rather than every toon load up perfect first time. although it would be more simple if every addon used profiles the exact same way, at least now i can take care of it quickly before logging in. Last edited by Xinhuan : 05-02-11 at 06:47 AM.